42a High Street, Heytesbury, BA12 0EA. Kids eat free on a Saturday. and get 2x kids meals for free. 2x Roasts for £12 every Sunday. John Smith's Extra Smooth £2.50 a pint. Meat raffle: £1 a raffle strip. on Tuesday 30th January 2018, from 6.00 p.m.
All you can eat from 6.00 p.m. for £12.99. 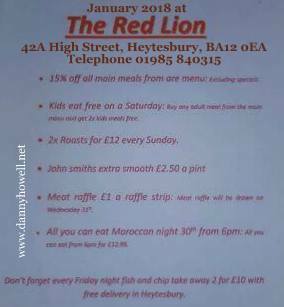 with free delivery in Heytesbury.